I had the esteemed honor of being grade school friends with Glenn Koepke in Lake Forest, IL in the ’80s. I remember playing a few terrible video games on his home computer during sleepovers before we eventually graduated to playing the NES together a few years later. Unfortunately, my family moved away and we lost touch. Over twenty years later we reconnected via Facebook only to discover that we both shared an obsession with arcade and pinball machines. I always remembered Glenn being a sports fan (We played little league together, he played hockey – I didn’t), but it seems that his love for sports never left him. 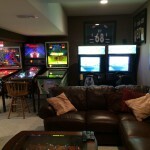 When I first caught up with Glenn, he was living overseas, but once he came back to the states, his two passionate hobbies merged together to create the incredible gameroom you see on your screen. Last year while attending the 30th anniversary of Pinball Expo, I was able to meetup with Glenn and his family to share a meal, catch up on old times, and to spend some time in his basement arcade. 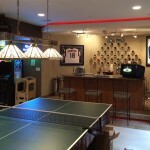 While the pictures certainly do the basement gameroom justice, it is even more incredible in person. 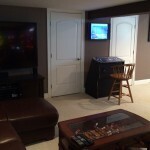 Normally I provide a more artfully crafted write-up for my gameroom showcases, but this time I’m going to let my friend Glenn and his pictures do most of the talking. Enjoy! Q: What was your inspiration for creating the room in the way you did? 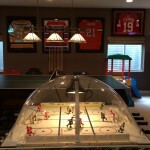 Glenn Koepke: I have always been inspired by the movie ‘Big’ since I was a young kid and have always been a sports fanatic so I decided to invest in my own dream world which was a combination of arcade games, sports memorabilia and a place where many ages could come together and have good ole’ fashion family fun. 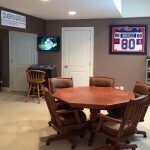 How I got it past the decision maker, aka my wife, was when my family bought a house while moving back to the US from the Netherlands and the agreement my wife and I had was I could do whatever I wanted in the basement. Needless to say she didn’t know what the vision was. 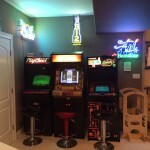 Q: Does your gameroom have a name? Q: What was your first game and why? 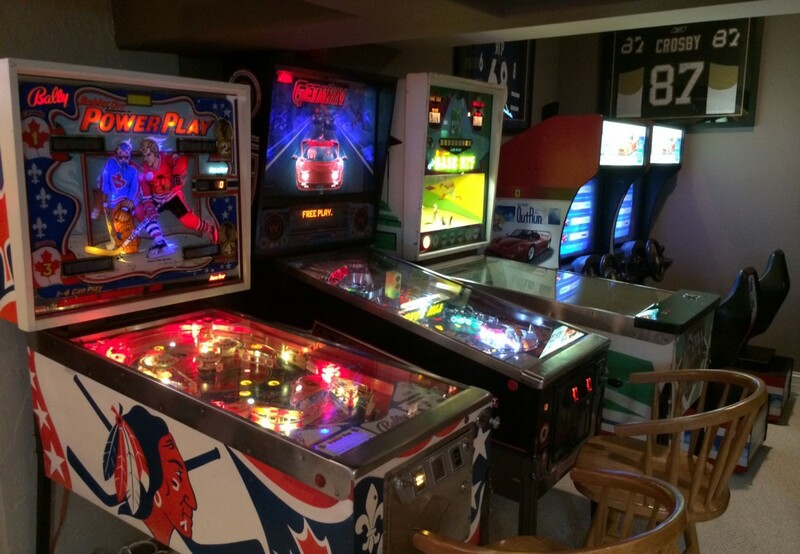 GK: Since I enjoy a variety of types of games I will highlight my first arcade game, pinball and redemption game. My first redemption game was a full size super shot arcade (pop-a-shot) arcade by Ice. I don’t look like a basketball player but it has always been my favorite arcade game. I bought the game from an arcade going out of business near Detroit and had them help me load it into a uhaul where I drove to Chicago. What I never figured out was how I would get it out if the truck by myself…the game weighs 800 lbs. I hired a crew while in transit and they never showed up so I walked into a restaurant and got a couple of the cooks to unload it with me into a garage. My first arcade game was an Ivan Stewart Off-Road which I always played at a Sluggers as a kid so I had to have one. It still has a soft spot with me any time in see it as I sold mine a year ago to make room for more single player type games. My first pinball was a Getaway High Speed II, my dad owns a Corvette pin which has always been one of my favorites to play and wanted to have something that was car themed and always had fun playing this pin when I was younger. GK: I remember being a young kid and playing Nintendo with Preston in Lake Forest, IL. It’s hard to believe that Preston and I reconnected through Facebook and then saw each other in person at the Chicago pinball expo after 25 years. I have always favored sports games my whole life, although I do enjoy Zelda and Super Mario Bros. I would frequent Sluggers batting cages when I was a kid and hence I played all the sports games they had and then I would always play whatever game they had at restaurants and bars. While in college I was into video games and made it a goal to collect every system produced and gave up on that dream after about 10 systems as I never had time to play them all so I sold most of them. Q: What inspired you to begin collecting games in the first place? GK: My parents never let me have many electronics as a kid and my grandfather was always toying around with the latest technology so he always inspired me and was a big role model for me. He was one of the first people I knew to have an 8 bit Nintendo and he was in his 70’s! Whenever we would visit I would get to play Atari 2600 and Nintendo, such a thrill for a young kid. I remember my sister, brother and I begging our parents for a Nintendo so one Christmas we were thrilled to find it under the tree. I remember being glued to our 13″ tv playing it non stop. As I got older and was in a financial position to invest in what I enjoy the thrill of the chase became a reality. I never really knew people had arcade games in their house until my dad wanted to buy a pinball machine while I was in college so I helped him throughout the process and I had so much fun I knew I wanted something like that once I was more established.5. 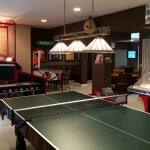 What games and/or objects are your favorite addition to your game room? One of my favorite games is a 1967 Base Hit pitch and bat. 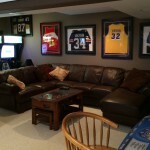 The old EM games seem to attract people that come over and I always love hearing the bell ringing when someone scores. I also enjoy the look of the super chexx where I had an artist custom paint the players so it’s the Pittsburgh Penguins vs the Detroit Red Wings. My wife and I are 2 of the players. She is the Wings fan and I am the Penguins fan. The hardest game to get in my basement was the Super Shot basketball game. I had to have someone cut the legs off in my driveway and have a 4 man crew move it to the basement where the legs were welded back on. To their knowledge nobody at ICE thought this had been done before. Let’s hope the next house buyers buy it with the house. 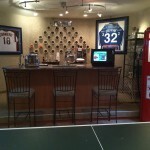 From a sports memorabilia standpoint my favorites are the 1980 USA olympic hockey jersey autographed from the team, MLB bases turned into bar stools and then an autographed picture of Jadeveon Clowney knocking off the Michigan running backs helmet over the guest bed. My father in law is a michigan fan and I am a Gamecock alum. He takes it in good spirit! 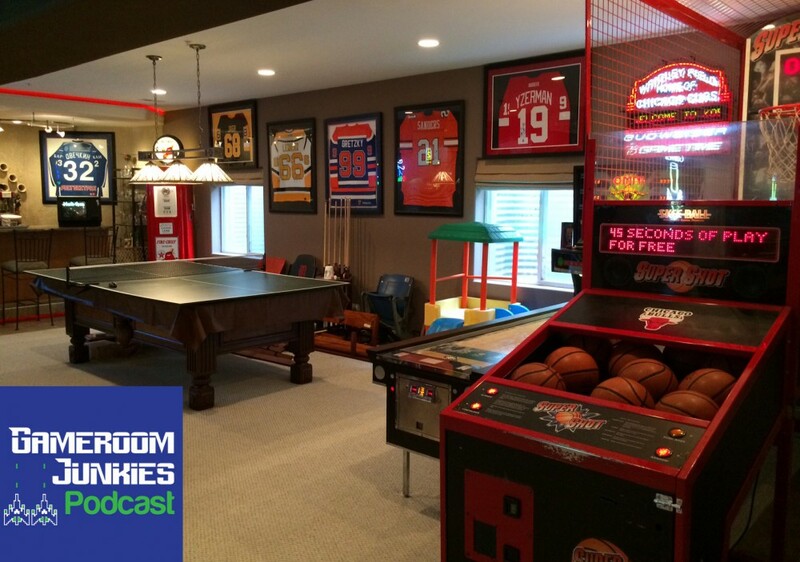 If you would like to be considered for a Gameroom Showcase, just shoot an email to gameroomjunkies@gmail.com with some photos and a brief introduction.